In this issue of the newsletter, there’s new research on Shell following on from their AGM in the Hague earlier this week, information about the Tate à Tate audio tour that was recently launched, and lots more bits and pieces. 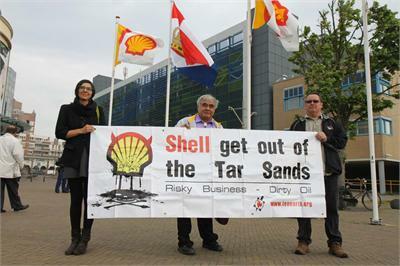 The Shell AGM took place in the Hague ealier this week. James Marriott from Platform was there putting some tough questions to the board, alongside allies including Indigenous Environmental Network, UK Tar Sands Network, Milieudefensie and many more. You can read his account of the day here. To coincide with the AGM, Platform, Greenpeace UK and FairPensions co-published a new report Out in the Cold – Investor Risk in Shell’s Arctic Exploration that details Shell’s existing and planned oil exploration and production projects in the offshore Arctic, with a focus on risks for the company’s investors. The report, which you can download here, will form the basis of a series of briefings with the investment community in coming months. Earlier on in the week, we also co-published Risking Ruin: Shell’s dangerous developments in the Tar Sands, Arctic and Nigeria, alongside the Indigenous Environmental Network, Redoil, UK Tar Sands Network and others. The report profiles Indigenous communities impacted by Shell’s operations in Canada’s Alberta Tar Sands, Aamjiwnaang First Nation’s territory in Ontario, Alaska’s Arctic Ocean and Africa’s Niger Delta and can be downloaded here. And finally, for Shell-related news, people might be interested to read Ben Amunwa’s guest blog on the Greenpeace UK site – Shell admits funding Niger Delta “warlords”. Download the audio files for free from www.tateatate.org and then listen to them in Tate Britain, Tate Modern and the boat journey down the Thames in between the two. You bring the iPod, Tate à Tate will bring a whole new experience of the gallery. There’s a two minute video promoting the experience, and we are also offering a workshop to student groups who may want to explore the issues after taking the tour. You can also listen to a radio programme chatting with the sound artists involved here that was originally broadcast on Resonance FM. We were also interested to note recently that Tate has decided to rebrand its new performance-art space as The Tanks following a long period of referring to them as The Oil Tanks. 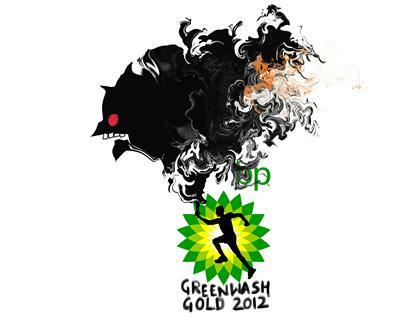 Vote BP for Greenwash Gold 2012! Some of the most disreputable corporate entities in the world are sponsorsing the London 2012 Olympics. Platform has supported the development of the Greenwash Gold 2012 campaign that is encouraging people to vote for who they think is the worst corporate sponsor out of BP, Rio Tinto and Dow Chemical. There are three short animations for each of the companies that you can watch here and then cast your vote. We’re cheering for BP. Documents sourced by Platform play a key role in a new Corporate Watch investigation revealing how British oil company Heritage triggered a Ugandan military operation that led to six Congolese individuals being killed, including a three-year-old child. You can read more about the investigation here. London-based European Bank for Reconstruction & Development plans to start lending billions to privatisation and fossil fuel projects in Egypt, following its controversial past in Eastern Europe. Platform and CEE Bankwatch commissioned a video exploring opposition amongst Egyptian workers and revolutionaries that you can watch here. Join James Marriott in a panel discussing Should we leave the oil in the ground?, alongside Rob Hopkins, Juliet Davenport and Andrew Simms. More information here. We’re really excited that Emma Hughes has started working with us at Platform. Emma is an activist and writer. She is co editor of Red Pepper magazine and is soon to complete a PhD which looks at the way the genetically modified food debate has been framed. She previously worked at ActionAid International and People & Planet. Emma will be working as Platform’s Energy Policy campaigner challenging the UK and EU’s external energy policies and the oil companies who shape them.